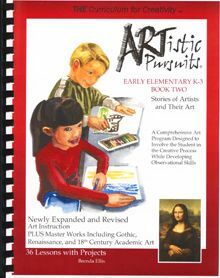 ARTistic Pursuits is a homeschool art program that includes all components of a visual art education: art history, art appreciation, art vocabulary, and art techniques. 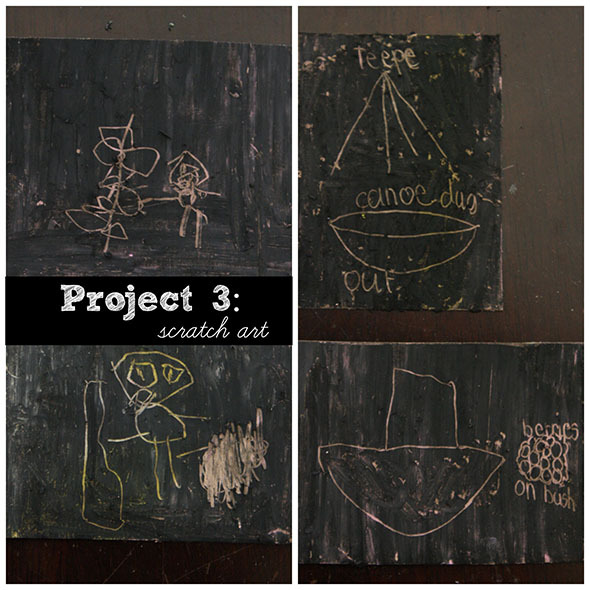 Children use real art materials and tools. 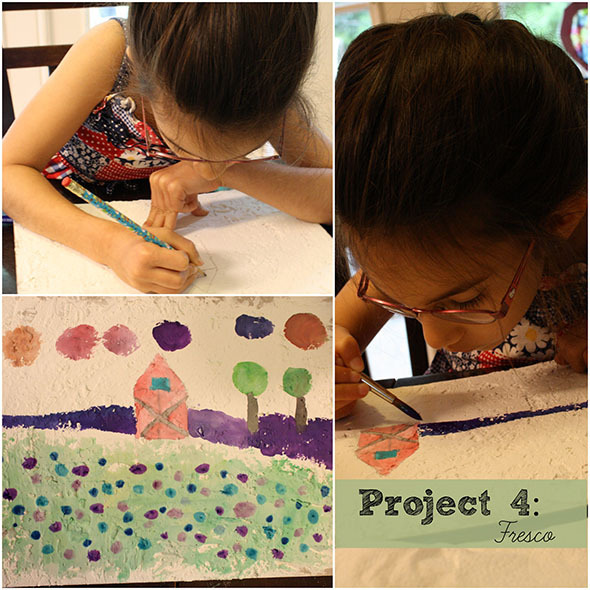 The lessons are in color and allow the student to be creative and expressive, while also learning technical aspects of art. We were sent Early Elementary K-3, Book 2: Stories of Artists and Their Art to review. There are 36 lessons and 175 illustrations in this soft cover, comb-bound, 85 page book. It retails for $47.95. The lessons are geared for kindergarten to grade 3, but if you are using this with a range of children, the lessons could be tweaked a bit to accommodate a 4 year old or a 4th grader. There are beautiful copies of master works from the Gothic, Renaissance, and 18th Century Academic art for the children to observe in detail and discuss; and while the art projects reflect the artist being studied, there are no replications of the master work. 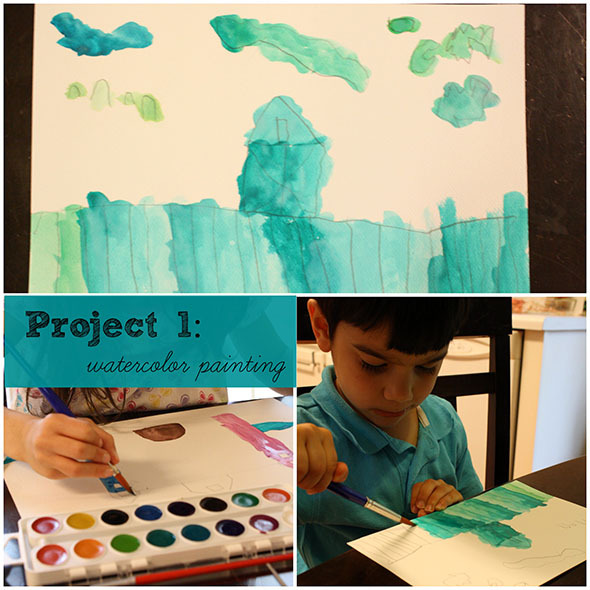 Instead, the children must draw from their imagination or surroundings for inspiration for the art project. You can see samples of a few lessons to give you an idea of what I mean. The introduction to the lessons is wonderful. Brenda Ellis, the author of ARTistic Pursuits, explains how critical it is to teach our children observation skills and that this makes the difference between a student who is ready to make art and one who seems void of ideas. She quotes Charlotte Mason, too, on the value of appreciating art from the past. Brenda Ellis remarks that a child’s art will be better with time spent in nature, which makes me glad we do nature study. I had ordered our supplies online ahead of time, so when our book arrived, we were ready to start. There are 36 lessons, so that provides a weekly art lesson for the whole school year. Hence there are 2 parts to each lesson, and there are 2 lessons (or Projects) per artist. Except that Project 5 on color mixing kind of just stuck out alone. 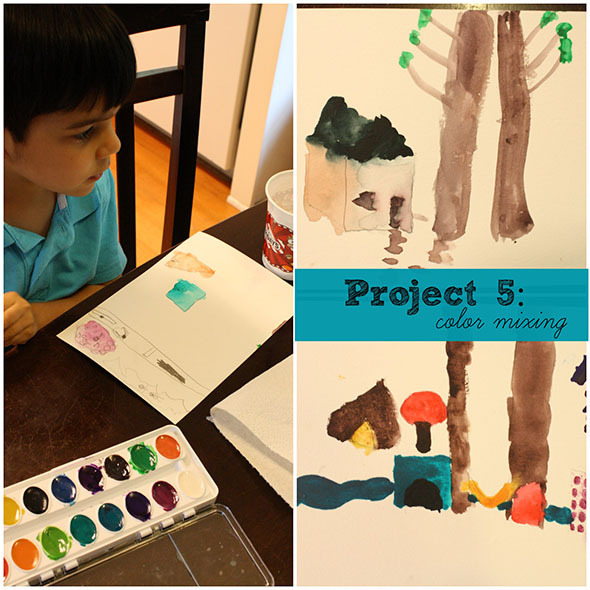 During the time of the review, we had time to get all the way to Project 6 (From Sketch to Watercolor) because I combined Project 5 and 6 together. 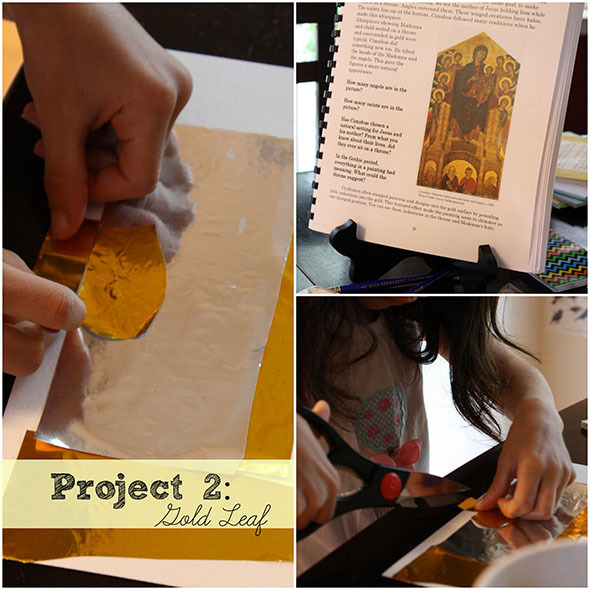 First we read about Cimabue and did a watercolor project. It was a bit hard to think of subject material for the painting. The book said to look at buildings in our neighborhood and to paint a picture of where we live. That did not inspire us very much. Bear ended up painting a castle (inspired by the drawing in the book). J-jo was not happy with his castle that day, so he re-did this project while Bear worked on Project 4 some weeks later. He tends to copy either myself or his sister for project inspiration. Project 2 involved observing Cimabue’s Madonna Enthroned with Saints and Angels. We then painted a picture to which we added gold leaf (gold and silver origami paper). Bear loved this project. I knew the scratch art project was going to be hard on their little hands so I cut the paper quite small. First, we were to color a piece of paper with the oil pastel colors we wanted, though it was recommended to use light colors. Then, we were to color over it with a black oil pastel. I ended up having to do J-jo’s coloring for him. Lastly, we were to etch a drawing into the black. We used toothpicks as our drawing tool. Both kids used the morning’s history lesson on Native Americans as their inspiration for the etchings. The artist for this project was Giotto. Since Giotto was known for his fresco paintings, it was logical that the next project would involve making a fresco. This project took a bit of advanced preparation as I had to spread spackling paste on a board and let it dry before Bear could paint on it with the watercolors. She was supposed to paint a scene showing the emotion of the people in it, as per the lesson, but she wanted to do a landscape instead. We looked at The Lamentation of Christ (by Giotto) for this lesson. Brenda Ellis includes information about the master works she has included in her curriculum. She also has included questions to help parents discuss the art with their children. These master works pages are my favorite pages of the program. Project 5 involved mixing colors and then painting a picture using the colors we mixed. Instead, we mixed colors, read the Project 6 portion about the Limbourg Brothers, and then did the Sketch to Watercolor Project using the colors we mixed as part of Project 5. Art is something that is very important to us. I love how ARTistic Pursuits has pieced together every component of art education for me (art appreciation, art history, and art techniques) saving me lots of time online trying to piece it together myself. This is not a learn to draw program, though. There is no direct drawing instruction. Although this might be a negative to some, I merely add some drawing books to help us draw what we want for the ARTistic Pursuits projects. As the kids learn to observe and draw from their observations, their drawing skills should improve. Overall, I highly recommend ARTistic Pursuits. Early Elementary K-3, Book 2: Stories of Artists and Their Art has been a great addition to our homeschool and we look forward to completing the book. Check out the new Sculpture program too. You can read reviews of all the ARTistic Pursuits levels by clicking on the graphic below.